ALCHEMY is one of the scientific media of colleges and researchers to develope dan to share their science and technology research not only Indonesia but also International. This journal is managed by Chemistry Department, Science and Technology Faculty, since October 2009 with ISSN 2086-1710. This journal is published twice a year, on March and October. 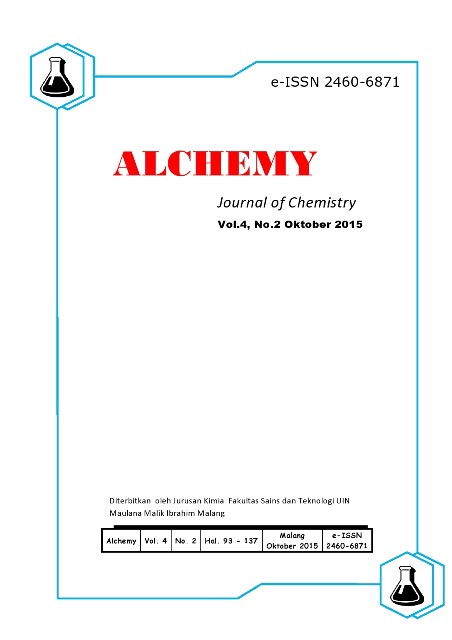 In August 2015, Alchemy was renamed to Alchemy: Journal of Chemistry. With changing the name, ALCHEMY: Journal of Chemistry officially changes from printed to online journal with new ISSN 2460-6871. This journal contains some articles with varied topics in chemistry such as physical chemistry, inorganic chemistry, organic chemistry, analytical chemistry, natural science, biochemistry, halal product, and marine. The article can be submitted in Indonesia or English. This work is licensed under NME Creative Commons Atribusi-NonKomersial-BerbagiSerupa 4.0 Internasional.